Operation Pomegranate, during the Second Battle of the Odon, comprised a series of attacks by 30 Corps toward Noyers. Its intent was to divert German attention as 2nd Army prepared Operation GOODWOOD (July 18), and to gain ground where possible. On 14th July the division concentrated in the area Loucelles — Cristot — Fontenay le Pesnel; 49 Division was on our right front and 53 Division on our left. The Noyers area was strongly held by infantry and tanks, and 49 Division had had heavy fighting two weeks before in capturing Fontenay and Rauray. At 'H' hr, 0530 hours on 16th July, the troops of Phase I crossed their start lines according to plan; 197 Brigade on the right attacking with 5 East Lancashire and 177 Brigade on the left with 1/6 South Staffordshire and 5 South Staffordshire. Our troops were fighting in the real bocage for the first time. 5 East Lancashire soon met heavy opposition, their commanding officer was wounded and it was not until about 0800 hours that they reached their first objective east of Vendes and captured part of it. Here they remained, unable to complete the job, until at 1430 hours a strong enemy counter-attack, supported by tanks, overran their right company and forced the remainder of the battalion back to their start line. On the left, 1/6 South Staffordshire captured Brettevillette by 0645 hours with heavy casualties, finding the place lousy with well-laid anti-personnel and anti-tank mines; and by 0845 hours they were in Queudeville. Two-thirds of the tanks supporting 1/6 South Staffords had gone up on one of our own minefields, which our predecessors had promised, but failed, to lift; and many of our troops had lost direction in the thick dawn mist. 5 South Staffordshire captured the orchards west of Grainville sur Odon, and then Les Nouillons by midday, which meant that all 177 Brigade's first objectives had at last been taken. About 1330 hours the flails started to breach the large enemy minefield at Queudeville. In view of the lack of progress on our right flank, the heavy loss of tanks in the two squadrons supporting Phase I, and of the evident strength of the enemy at Noyers, Phase II took some time to mount. But at 1730 hours 177 Brigade launched 2/6 South Staffordshire against Noyers and 45 minutes later 6 North Staffshire (under command of 177 Brigade) attacked Haut des Forges. By bitter fighting 2/6 South Staffordshire forced their way into the village, but were later obliged to withdraw to point 126, just north of the station. 6 North Staffordshire met with less opposition and captured and held their objective at Haut des Forges. During this day 177 Brigade captured 369 prisoners, all from 277 Division. On 197 Brigade front 2/5 Lancashire Fusiliers attacked at 2230 hours, directed on to the Phase I objective; but the enemy mortaring on this flank was particularly heavy and accurate, and they failed to make any material progress. The next day (17th July) the main feature of the fighting was a series of attacks by 177 Brigade on Noyers. An attack by 2/6 South Staffordshire and one company of 5 South Staffordshire at first light almost reached the railway station; but it could get no further and remained more or less pinned there till 1330 hours when they were withdrawn to reorganise. During the afternoon 5 South Staffordshire attacked Noyers from the north-east, but barely penetrated the outskirts. At about this time 1/6 South Staffordshire started to advance from Brettevillette towards Bordel, but met with violent resistance. After dark all troops drew back a little from Noyers, so that it could be shelled and mortared. On 197 Brigade front 1/7 Royal Warwickshire, supported by 1 Northamptonshire Yeomanry & crocodiles, successfully attacked and held the original Phase I objective, crossing their start line at 1230 hours which was good going for the mounting of a rather complicated attack. Later, to strengthen this flank, 176 Brigade attacked towards Bordel, with limited success. During the night headquarters 1/7 Royal Warwickshire was hit, quite by chance, by two large bombs, which caused serious casualties. 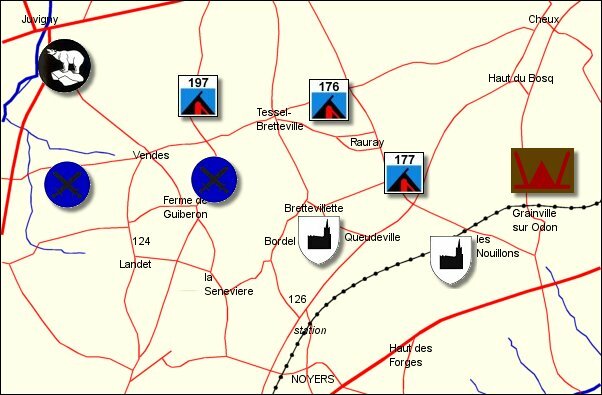 On 18th July, at 1000 hours 177 Brigade put in a full scale attack on Noyers, with 1/6 and 5 South Staffordshire supported by tanks, crocodiles and armoured engineers. This attack was pressed with great vigour and bravery, but it could make little progress against the determined enemy resistance, and five of our tanks were knocked out, the squadrons having been already seriously depleted by mine casualties in the two previous days' fighting. Yet another attack in the afternoon also failed and at nightfall all troops were again withdrawn so that Noyers could be subjected to another night's shelling. On the right 1/7 Royal Warwickshire worked their way forward to occupy Ferme de Guiberon by nightfall; and 49 Division reported enemy withdrawals on their front. In the centre 176 Brigade (7 South Staffordshire) attacked towards Bordel, capturing and holding the whole area up to la Senevière. They met few enemy, but were heavily shelled and mortared. During the night 176 Brigade relieved 197 Brigade, so that it could fall back into reserve, 7 Royal Norfolk relieving 1/7 Royal Warwickshire at Ferme de Guiberon, point 124 and Landet, the two latter having been occupied by 1/7 Royal Warwickshire after dark. Early on the 19th 49 Division occupied Vendes, the enemy having withdrawn. Dawn patrols from 177 Brigade, however, found Noyers still occupied and planning was started for a set-piece attack upon it by 197 Brigade. But the Army Group plan no longer required us to press so heavily against Noyers, and at 1230 hours the Corps Commander ordered us to give up for the present the idea of capturing Noyers, though we were to continue to make our presence felt by vigorous patrolling over the whole front. Though the battle had yielded no prize like Caen, casualties had been almost as severe: 1,250 killed, wounded and missing in the division in the three days fighting, including, for example, 167 in 2/5 Lancashire Fusiliers. We had taken 575 prisoners. The enemy opposing us were 276 and 277 Infantry Divisions, supported by elements of 2 and 9 SS Panzer Divisions. They contained Austrians, Poles and Russians (one only 15 years old), as well as Germans; though good fighters they were prepared to surrender when over-run.